GP position 25 minutes from Brisbane CBD, one of the closest DWS practices to the city. Situated to the south of the river, the practice has an established patient base and is a friendly and supportive work environment. You will be contracted to work full time, 40 hours per week. Weekends are on a shared roster (1:3 or 1:4) and allow you to take time off during the week in return. The practice would be especially interested in attracting a female to take over this already established patient base. To be considered for this position you must have MRCGP, PMETB/JCPTGP or FRACGP or equivalent. A popular suburb just 25 minutes from Brisbane CBD. The practice is located in a busy shopping area with it's own onsite car parking. There is an excellent private school close by. 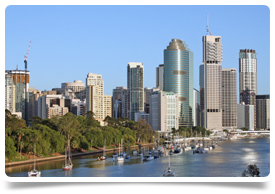 Brisbane is the state capital of the Australian state of Queensland and is the largest city in the state. Brisbane has an estimated population of approximately 2 million. It's a cosmopolitan and lively city that is home to many different types of scenery, including skyscrapers, parkland and even an artificial beach. Brisbane also gives easy access to a number of attractions as well as the Gold Coast and the Sunshine Coast. It has a humid subtropical climate with hot, humid summers and dry, mild winters – perfect for enjoying the Queensland outdoors lifestyle.